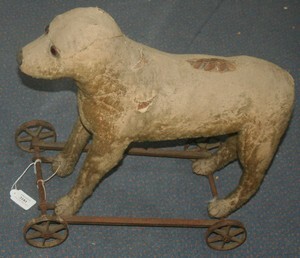 An early 20th Century straw-filled soft toy dog, with amber and black eyes and vertically-stitched nose and paws, mounted on a metal chassis with cast iron spoked wheels (playwear, lacking ears and tail, the chassis and wheels rusted). 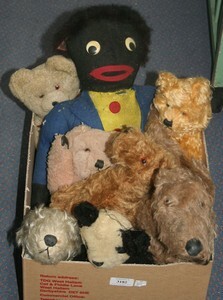 A mid-20th Century mohair teddy bear, with amber and black eyes and stitched snout, the jointed body with felt pads, height approx 33cm, together with a golly and other soft toys. 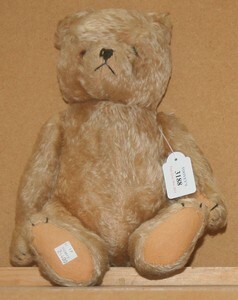 A modern Steiff 1930 replica teddy bear, with gilt button and tab in the left ear, amber and black eyes, stitched snout and claws, and open mouth, the jointed body with felt pads, height approx 29cm, wearing a blue studded collar and bell. 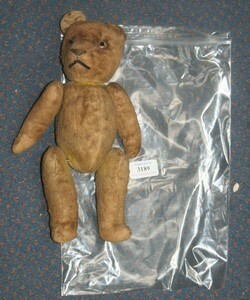 A Mother Hubbard teddy bear, with black eyes and vertically-stitched snout, the jointed body with felt pads, height approx 53cm. 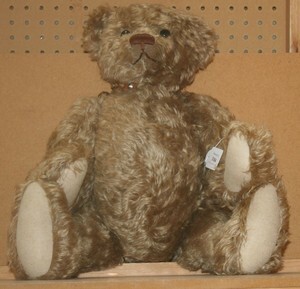 An early 20th Century humpback mohair teddy bear, with black and white eyes, vertically-stitched snout and four claws, the jointed body with fabric pads, height approx 43cm (bald patches, stitching loose, pads replaced). 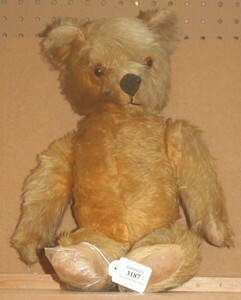 An early 20th Century German mohair humpback teddy bear, with wide apart ears, boot-button eyes and vertically-stitched snout and claws, the jointed body with felt pads, height approx 47cm (some bald patches and playwear). 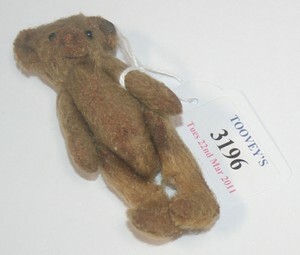 A Pedigree mohair teddy bear, with amber and black eyes, felt nose and stitched mouth, the jointed body with felt pads, height approx 52cm (faults). 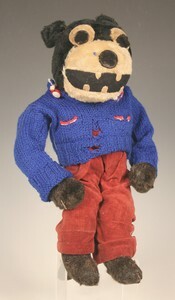 A mid-20th Century teddy bear, with amber and black eyes and stitched snout and claws, the jointed body with felt pads, height approx 40cm. 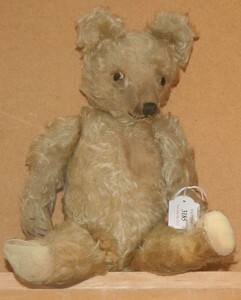 A mid-20th Century teddy bear, with black and white eyes, stitched snout and jointed body, height approx 28cm. 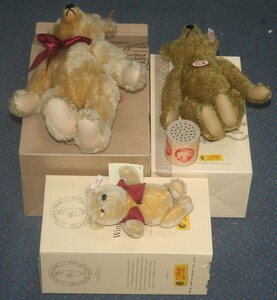 A modern Steiff Winnie-the-Pooh mohair bear, with gilt button and tab in the left ear, black eyes, stitched snout and jointed body, wearing a red waistcoat, height approx 19cm, and two other modern Steiff teddy bears, all boxed. 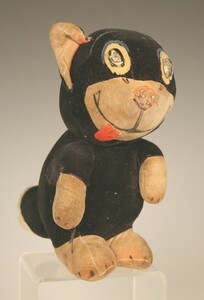 A soft toy figure of Felix the Cat, height approx 36cm (some bald patches and playwear). 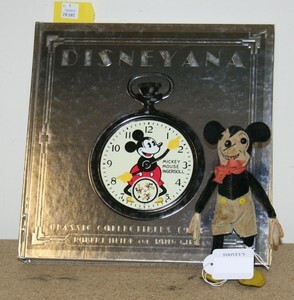 A Deans Mickey Mouse, with velveteen body and boot-button eyes, height approx 15cm, together with a book, Disneyana Classic Collectibles 1928-1958, by Robert Hide and John Gilman. 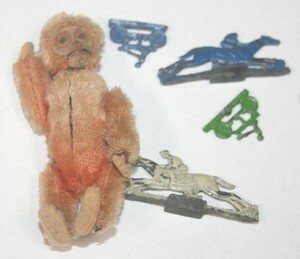 A Schuco lipstick and compact monkey, the removable head with black eyes, the hinged body with compact recess, mirror and jointed arms and legs, height approx 9cm (wear and faults), together with a Glevum Series Dirt Track racing game with four counters (faults). 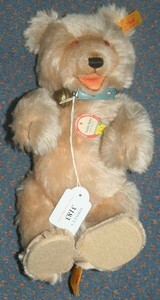 A Chad Valley Oloo velveteen soft toy, with button, black and white eyes, smiling face and red tongue, height approx 18cm (some playwear, tail hair worn). 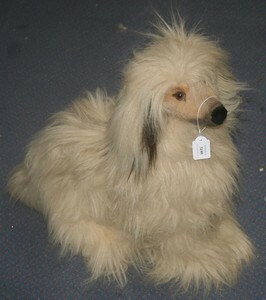 A modern Steiff soft toy seated Afghan hound, with gilt button and tab in left ear, and amber and black eyes, height approx 46cm. 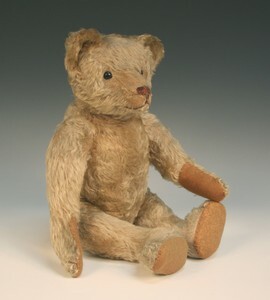 An early 20th Century Steiff small mohair teddy bear, with button in left ear, boot button eyes and jointed body, height approx 9cm (bald patches and wear).